I love this salad. I remember going to Kansas City and Dennis ordered this salad. Inspired, I went home and imitated it! Easy to make, family and friend favorite. Dennis loves it without the bacon as well. Who would have guessed that! 1 quart strawberries – cleaned, hulled and sliced (No stawberries? 2.In a large bowl, combine the spinach, strawberries and almonds. Pour dressing over salad, and toss. Refrigerate 10 to 15 minutes before serving. I have prepared this two ways: hot and cold. Fried and crumbled bacon, then added all dressing ingredients till sugar dissolved. Pour this hot dressing over spinach/strawberries: outa this world! Also delicious prepared cold. Adding chicken chunks and kiwi is another wonderful variation for a complete, colorful meal in a bowl! 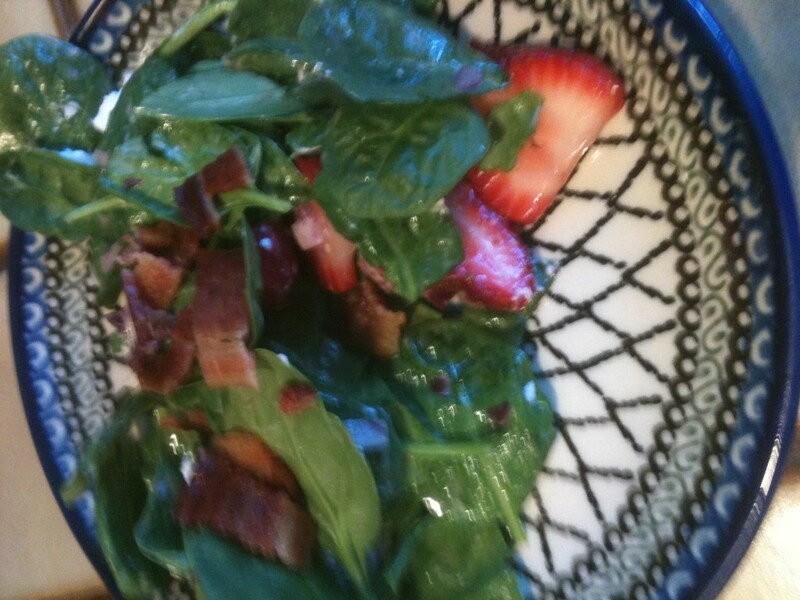 This entry was posted in Salads and tagged bacon, Red Onion, Spinach, strawberry. Bookmark the permalink.